Square Enix confirms that Kingdom Hearts III will have the series’ core cast reprising their roles. 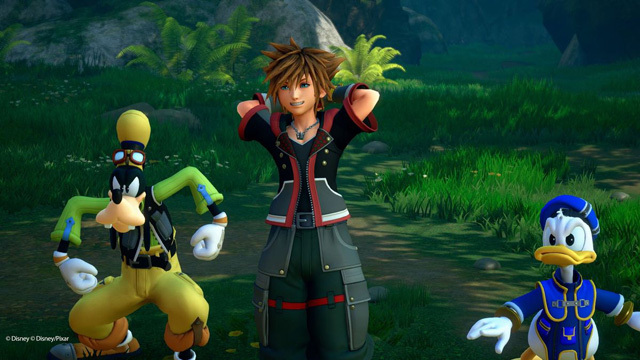 That assures that fans will hear Haley Joel Osmant, Tony Anselmo, and Bill Farmer will still voice Sora, Donald Duck, and Goofy as they have done since the series’ inception in 2002. In addition, a number of stalwart Disney voice actors will reprise their characters from their feature films. Confirmed so far are Idina Menzel (Elsa), Kristen Bell (Anna), Josh Gad (Olaf), Jonathan Grof (Kristoff), Zachary Levi (Flynn Rider/Eugene), Donna Murphy (Mother Gethel), John Ratzenberger (Hamm), Wallace Shawn (Rex), Tate Donovan (Hercules), and Kevin R. McNally (Gibbs from Pirates of the Caribbean). A number of other famous Disney characters have been seen to date in the game’s promotion like Woody, Buzz Lightyear, Mike, and Sully, but no word on whether they will retain their original English voices like Tom Hanks, Tim Allen, Billy Crystal, and John Goodman. (Woody has been known to be recast with Tom Hanks’ brother, Jim Hanks, in certain cases, which may be true here). Kingdom Hearts III launches on PlayStation 4 and Xbox One January 25th, 2019, ending the 13 year-long wait for the epic conclusion to the core Kingdom Hearts trilogy. It includes a number of Disney worlds not seen in previous titles, like Toy Story, Monster’s Inc., and Frozen.